Here’s a quick question. What best reminds you of Goa? Sandy pristine beaches, Port wine, fun loving people and awesome seafood. But are we missing something? Yes of course!! How could we miss the Goan Pork Sausages, the best gift that Goa could give the world? 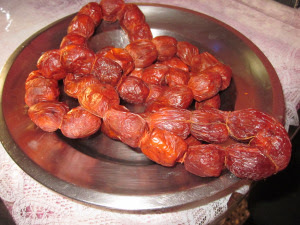 The Sausages, Lingis (Linguica) or Choriso as they are called in local language are often ranked number one on the shopping list of any tourist visiting Goa. I, for one, have been lucky enough to have an aunt who visits Goa at least 2-3 times a year and thus I have my year long supply continuously replenished. In simple terms, the sausages are chunks of pork meat coated with chilly, spices, and marinated with vinegar giving them a fiery hot colour. These are then tied together with a thick thread. You could store them for at least six months. To tell you the truth, they barely remain that long, the magic is when you take the sausages, and there is a nice pungent aroma of the spices and vinegar that have by now mingled well with each other. Then, as you slowly tear the outer covering, the aroma fills your entire house. It has to be experienced. Because they come preloaded with a whole lot of spices and are already marinated, the sausages serve as a quick fix meal on a day when probably you have guests at a short notice or are feeling lazy to cook. All you need to do is chop some onions, a potato and add the sausages & some salt…. Done…. Your jhatpat meal is ready. My mum usually makes sausages in the manner mentioned above and they are awesome. 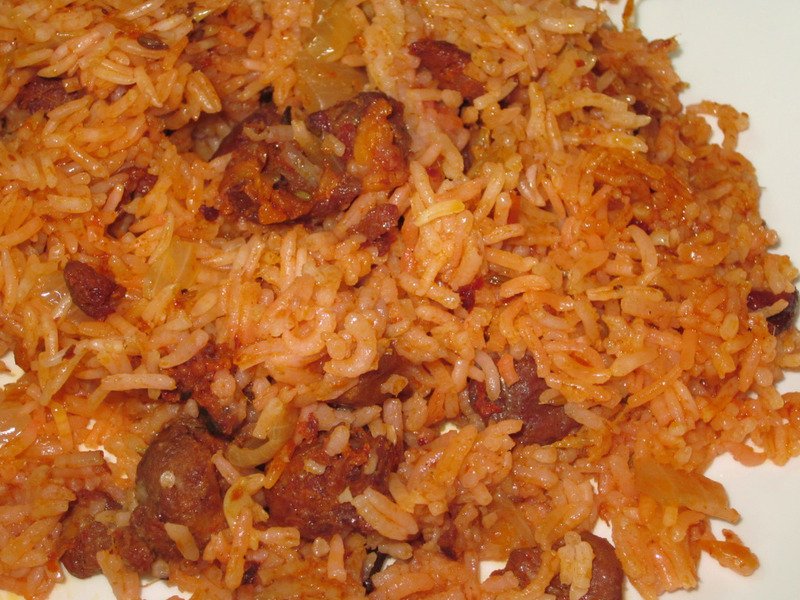 I had always wanted to make this sausage pulao and so I gave it a try this time. Spicy, aromatic, and yummy was how I would describe the result. As always make some extra, you never know someone might just drop in sensing the aroma. Wash the rice, and soak in water for about 20-25 minutes. Drain and keep aside. Peel the potatoes and cut into wedges. Heat oil in a pan and fry the potatoes till they are golden brown in colour. Keep them on an absorbent paper for oil to drip off. Open the casing of the sausages by cutting the string and keep aside. In a pan, add 1 teaspoon oil and heat. Add in the ginger-garlic paste and let it cook. Once the pastes start to brown, add onions, and stir well till they turn translucent. Add in the whole spices, chilly and potato wedges and let them cook for a while. Once the spices begin to give out an aroma, add in the sausages, and let them cook for about 5 minutes. Add the rice and mix well. Be careful when you mix as too much mixing will cause the grains to break. Add water and cover and cook for about 20-25 minutes. Remember to keep checking at regular intervals if more water is required. Usually, the proportion of rice and water is 1:2. So for 1 cup rice, you will require 2 cups of water. Voila!!! The Goan sausage pulao is ready…. Enjoy with friends and family.